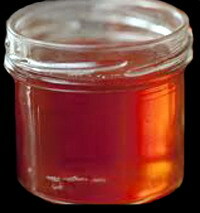 Fruit jellies are clear solid flakes of fruit juices tied together by pectin. The normal procedure is to have clear fruit juices without any sediment and generally, as we had seen earlier that pectin is very important constituent and is abundantly present in just ripening fruits compared to fully ripened ones. 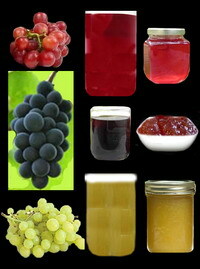 Hence for jellies you need just ripening fruits. 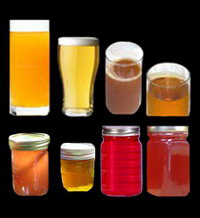 In some cases the pectin is present in the skin and in some in the pulp region. Follow the procedure for each correctly to get better jellies. Wood apple (ViLAmpazham), guava, kaLAkkAi (karOndA/Cran or Kiwi berry), Jackfruit and apple have more pectin and are suitable for jellies. A good jelly must be in the shape of the container it is kept in. Now let us learn how various fruit jellies are made. For this use either the white or the pink varieties of guavas which are just ripening. Wash under water, wipe and dry under fan. After some time, cut the fruits into thin slices and cook in water till they become soft. Take a clean and neat muslin cloth, keep it over a jar and tie the sides. Pour the cooked slices with the liquid and allow to remain for overnight. Never try extract the juice by squeezing but allow the juice to drip through the cloth into the jar. If necessary, decant the juice next day to get clear juice. Measure it and add 68% of sugar to it. For example, if the juice is 600 gms, then you should add 600×68/100= 408 gms of sugar, say 400 gms after rounding off to the nearest 100. Heat the sugar mixed juice constantly stirring till the sugar dissolves completely. Add the citric acid crystals and mix well. Heat till the first boiling stage. Remove and strain the boiled juice and cook again on a hot fire. Keep on stirring the mixture till it attains “end point” i.e., the required consistency of not sticking to the side of a knife when inserted, taken out and tested. The jelly now is very clear and shines like a crystal. Add the colour and preservative (SB) at this stage, mix and fill up in an air tight jar/bottle when it becomes warm, leaving head room of about 1 inch. Store in a cool place or refrigerate after the jar/bottle feels cold. The apple should be just ripening, tart and firm. Wash, wipe and cool dry. Cut the apples into small pieces, and deseed without affecting the central portion or peeling the skin. Add water to cover all pieces and heat to bring it to the boiling point. Reduce the flame and simmer for about 25 minutes till the pieces become soft. Extract clear juice and follow the rest of the procedure as explained for guava jelly above. Here if you find foam while boiling skim it off quickly. Pour into jar/bottle when warm after allowing head room of 1 inch and seal when cool with airtight lids. For this you can select firm seedless or grapes with seeds, whether green, red, purple etc and use the same colour. Wash the fruits gently and cool under fan for a few minutes. You must not use the stems but only the fruits. Crush and add water. Heat and bring it to the boiling point. Reduce flame and simmer for about 10 to 15 minutes. In this case, there is a chance for formation of tartrate crystals over the jelly. In order to prevent this, refrigerate the juice overnight and strain through a clean thick cloth after decanting the crystals, formed if any. The rest of the procedure including skimming off the foam quickly is the same as in the case of above jellies. For this you can select firm plus that have just ripened. Wash the fruits gently and cool under fan for a few minutes. Crush and add water. Heat and bring it to the boiling point. Reduce flame and simmer for about 15 to 20 minutes till the fruits become soft. The rest of the procedure including skimming off the foam quickly is the same as in the case of above jellies. 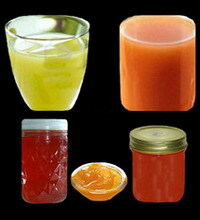 This way you can prepare jellies from other fruits like orange, jackfruit, kLAkkAi, wood apple, strawberry etc. 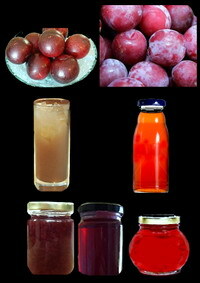 This entry was posted on April 27, 2012 at 8:46 pm and is filed under Jams, Morabbas, Squashes and Sauces with tags apple jelly, citric acid crystals, food colours, grape jelly, guava jelly, Jam, Jelly, Morabba, pectin, plum jelly, sauce, sodium benzoate, squash, sugar. You can follow any responses to this entry through the RSS 2.0 feed. Both comments and pings are currently closed.